Informazione prodotto "Tascam Recorder DR-22WL"
The DR-22WL is a streamlined model that has been designed to provide an easy-to-use interface so that anyone will be able to enjoy high-quality linear PCM recording without difficulty. For recording music played primarily on acoustic instruments, including acoustic guitars and wind and string instruments, this model is ideal. With its easy operation and high quality recording, this recorder can also be used for applications other than music, including for recording audio when capturing video with a digital SLR camera and for interviews. Not only does this handheld recorder meet the demand for recording high-quality audio with ease, it also has advanced Wi-Fi functions for full remote control, streaming playback and file transfer. Two unidirectional mic units are utilized together for stereo recording in an X-Y format. They are arranged so that their diaphragms overlap in the same axis. X-Y format recording can capture sound with a good stereo image and no sense of emptiness at the center. Since the mic units will not distort even at high volumes, recording with a great sense of nearness is possible even in high-volume situations. In addition, a shock mount structure is used to hold the mic capsules. This absorbs vibrations effectively even when mounted on a digital SLR camera. The scene dial has eight preset scenes with different settings. This function automatically makes adjustments according to the situation so all the user needs to do for optimal recording is press the record button. Of course, when "M" (manual) is selected, settings can be adjusted manually. When set to ">", the user can use the play function to adjust the speed of playback, change the pitch and use other features that are perfect for practice. The bottom of the large 128×128 LCD shows the next operations that are necessary according to the current conditions. The 4 function keys can be used to make selections for easy operation. This is a handheld recorder that can be easily mastered. 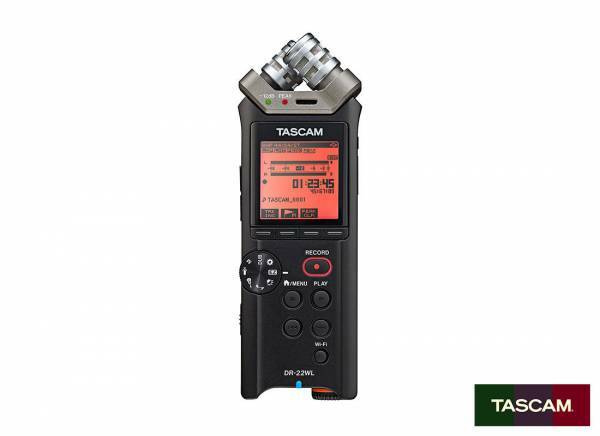 TASCAM has once again revolutionized handheld recording! The DR-22WL creates its own Wi-Fi network, and a free dedicated app can be used for remote operation without touching the unit. Not only does the app allow recording to be started and stopped, it can also be used to check and adjust input levels from an iOS or Android device. Everything related to recording can be done by Wi-Fi. Since the Wi-Fi transmission range is about 20m/65 feet, this feature can be used with the recorder in places that are normally out of reach. In addition, audio can be checked by Wi-Fi after recording. The audio quality can be checked through headphones connected to a smartphone. With operation capabilities and flexibility that exceeds infrared remotes - and reliability that approaches that of wired remotes - this handheld recorder allows freedom of placement that far surpasses that of previous models. he benefits of Wi-Fi are not limited to recording. Audio files can be transmitted via Wi-Fi to smartphones and computers. They can also be uploaded to SoundCloud using a dedicated application. SoundCloud is tightly linked with other social networking services. For example, if a recording is shared to Facebook, it will appear on the user's timeline. By uploading a live recording immediately after performance, audience members could listen to the concert again on their way home. Even though the DR-22WL is a professional recording device, it also has numerous automatic functions that make capturing high-quality recordings easy for anyone. In addition to automatic recording functions, the unit also has functions that simplify file management. Users can create high-quality recordings without complicated operations. In addition to recording, this unit also has functions that can be used for music creation. The overdubbing function allows new sounds to be layered over existing recordings. This can be used to add solo parts to karaoke and to create harmonies by recording the same instrument multiple times. By using the reverb effect, users can create sounds that are even more appealing using just the DR-22WL. 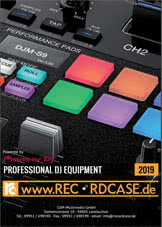 Sii il primo a scrivere una recensione per: "Tascam Recorder DR-22WL"